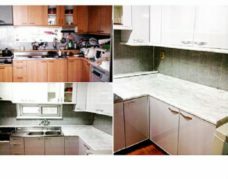 EZ Faux Granite films will instantly give your countertop, or any smooth surface, the look of granite. Use our vinyl to protect or update Countertops, Tables & Floors. Use in Bathrooms, Kitchens, Closets, Laundry Rooms, School Projects, Workshops, Office, Craft Projects, & Furniture. 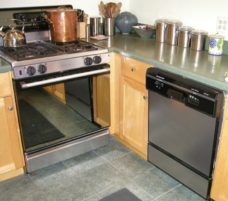 Cover Cabinets, Doors, Counter Tops, Shelves, Walls. Simply peel and stick the film onto your existing surfaces. Granite counters for a fraction of the price! EZ Faux Decor’s Bubble Resistant Self Adhesive PVC Granite Film is manufactured from upcycled plastics which are produced using a 5 step process to make high quality Self Adhesive PVC Granite Film. EZ Faux Décor’s Bubble Resistant Self Adhesive PVC Granite Film assists you in creating NEW looks and/or repairing the appearance of existing surfaces. EZ Faux Decor’s Bubble Resistant Self Adhesive PVC Granite Film has a peel away backing with measure and grid lines to make it easy for YOU to install. EZ Faux Decor’s Bubble Resistant Self Adhesive PVC Granite Film is manufactured in an ISO 9001 Certified Facility which provides high quality product consistently. EZ Faux Decor’s Bubble Resistant Self Adhesive PVC Granite Film is manufactured using a 5 step process. The PVC Film has a transparent top coat for durability, printed image, durable base, a non-toxic water based adhesive is applied then the tear away baking. The adhesive allows Self Adhesive PVC Granite Film to be repositioned during installation and removable without adhesive residue. EZ Faux Decor’s Bubble Resistant Granite PVC Film has been tested using KSM Standards 3006,6734,2274,3501 and 3073.